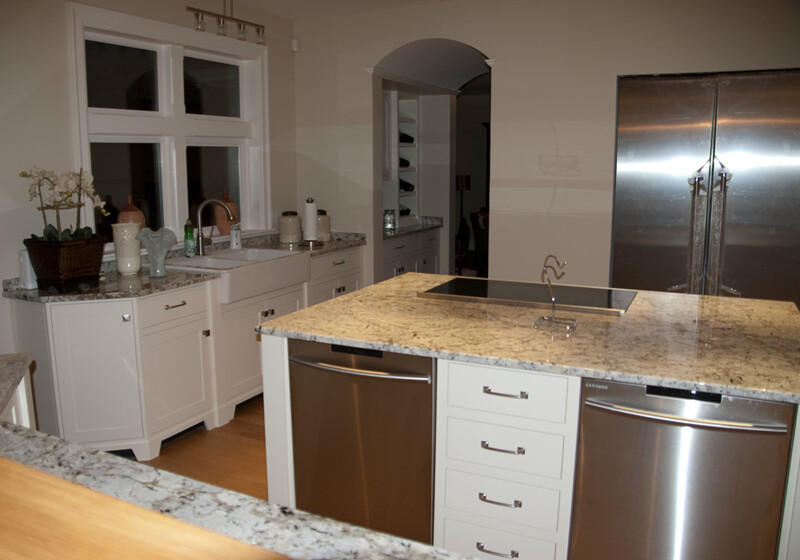 1600 hours went into creating this kitchen. 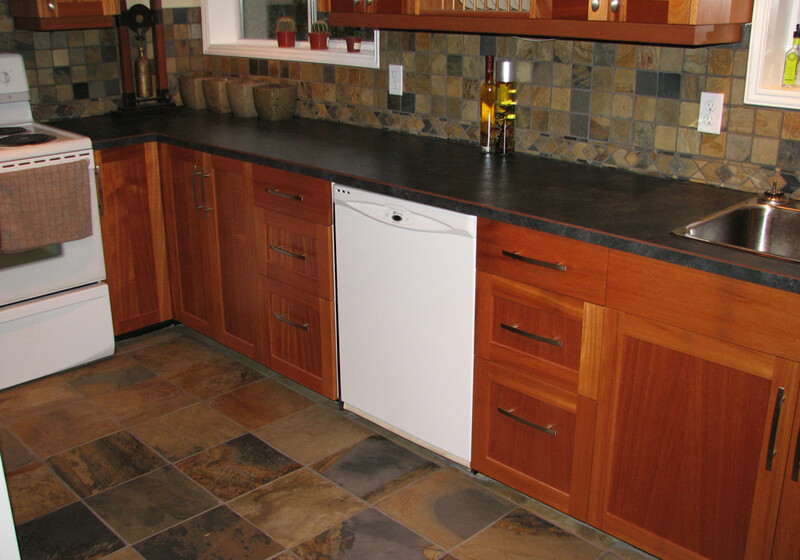 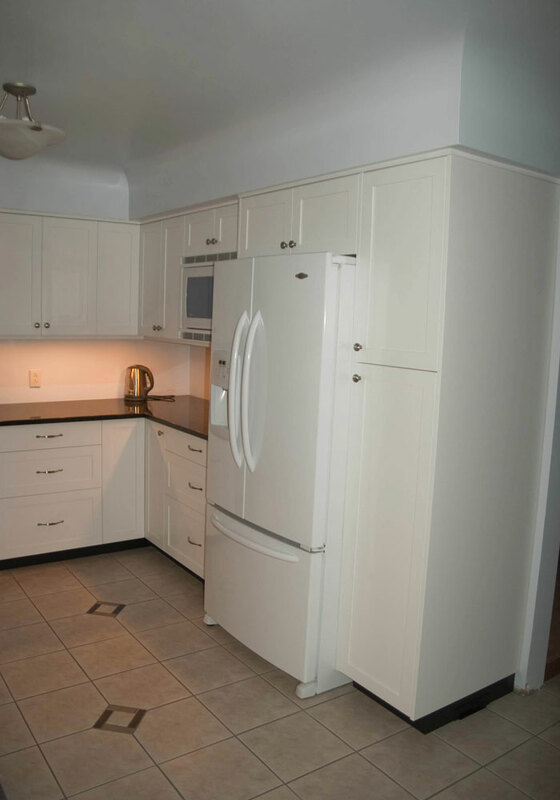 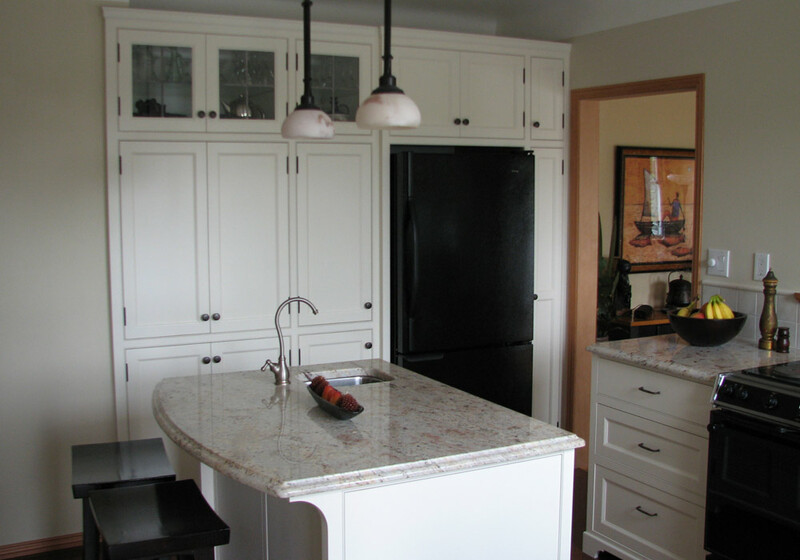 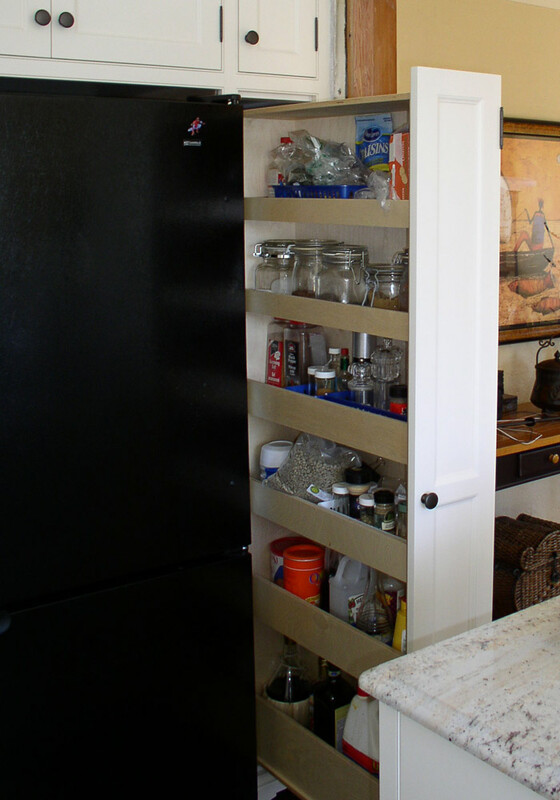 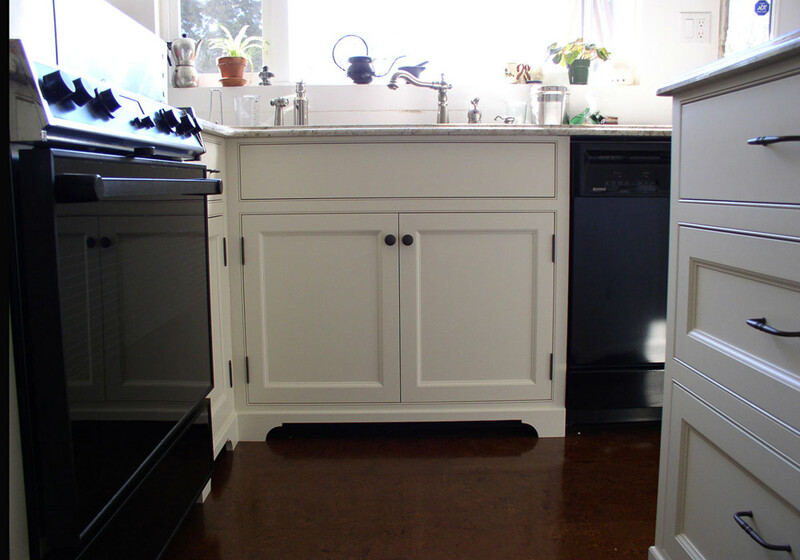 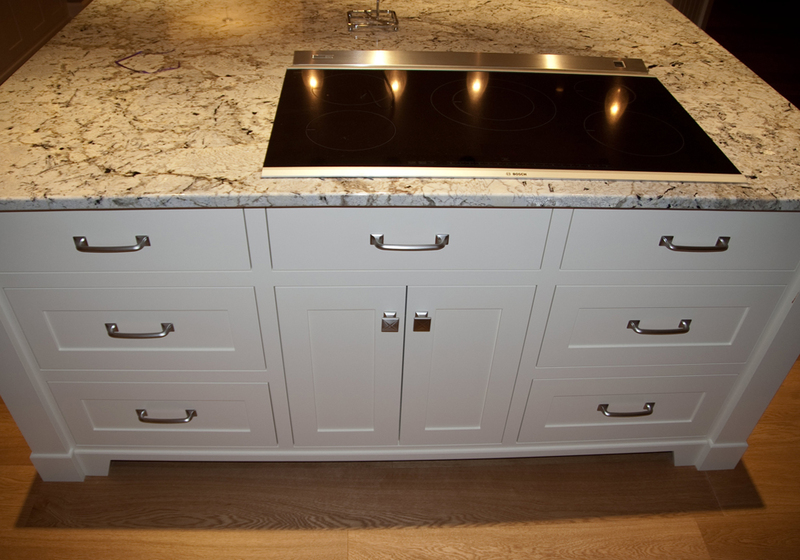 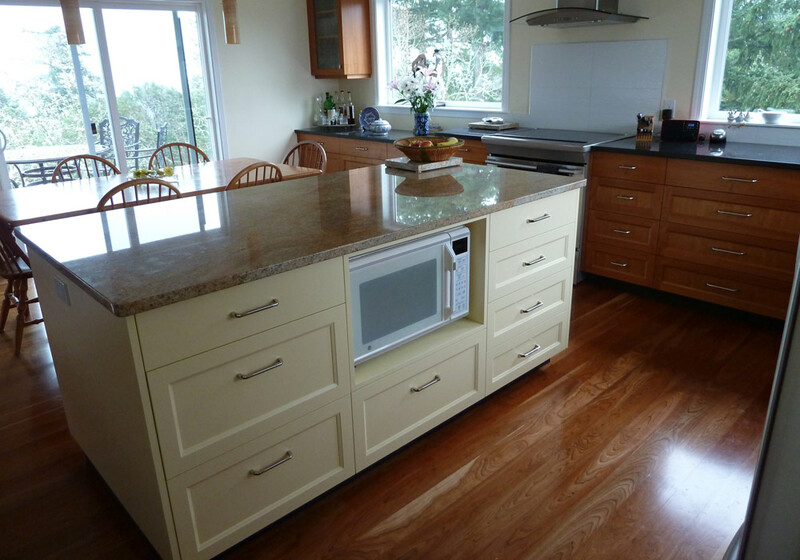 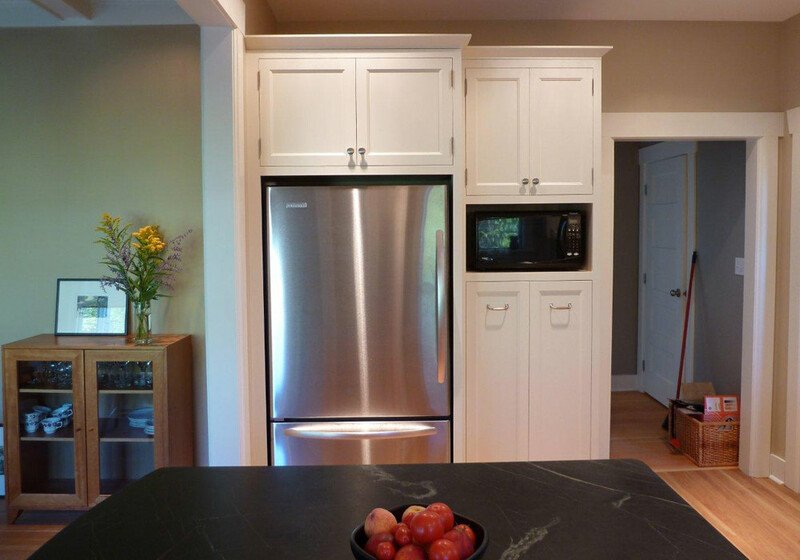 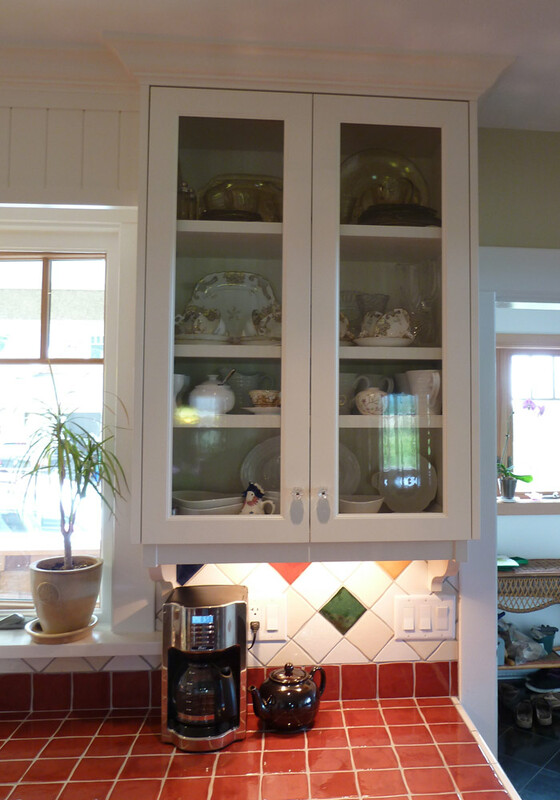 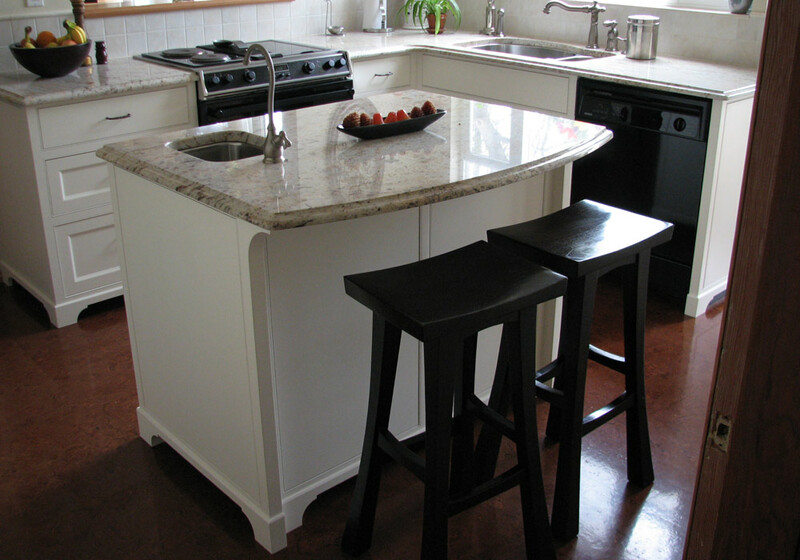 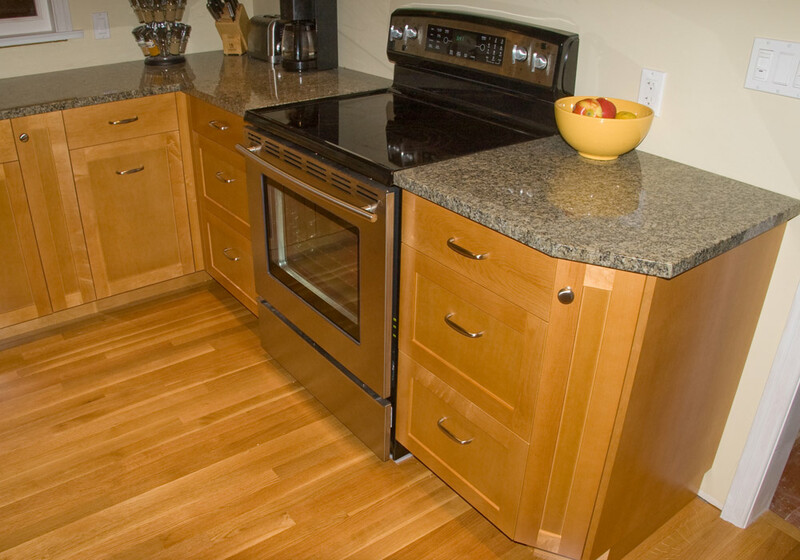 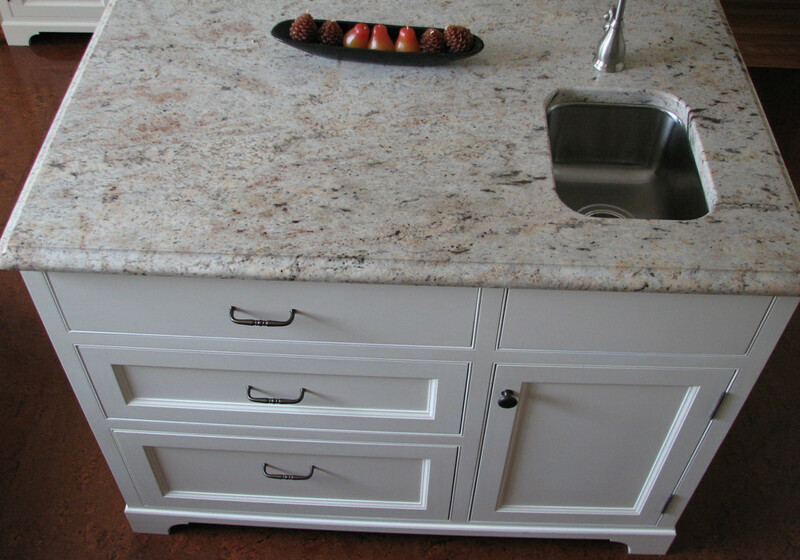 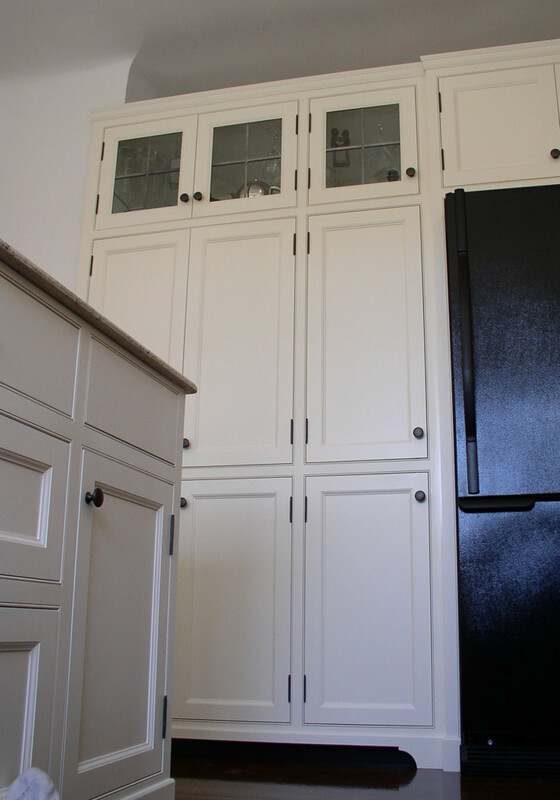 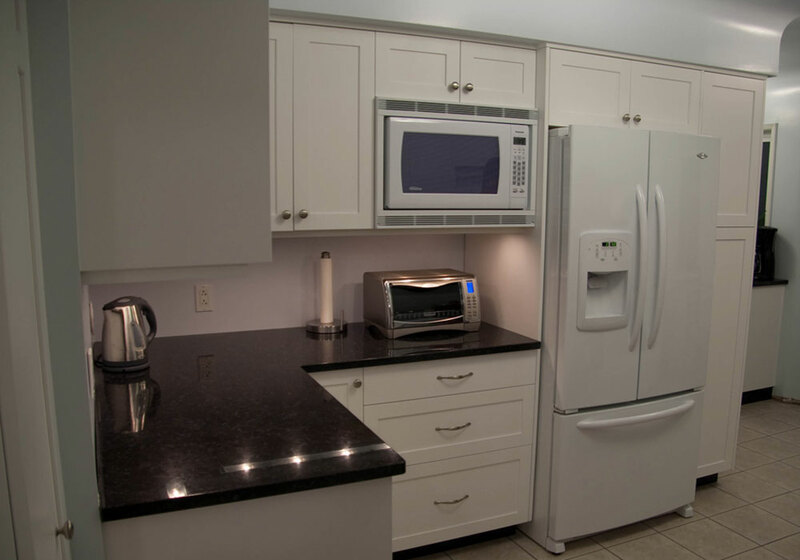 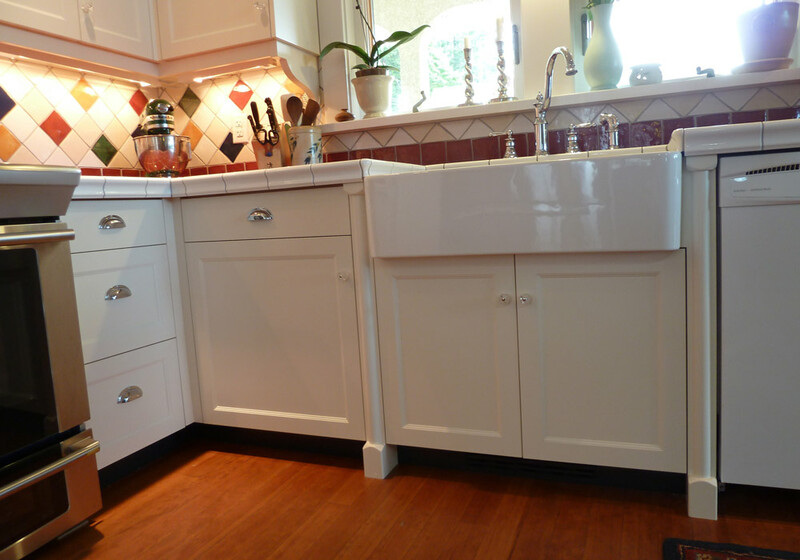 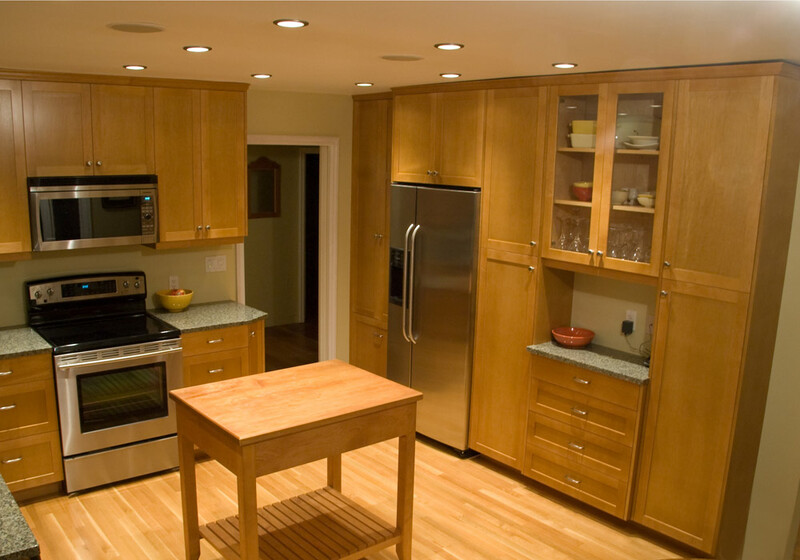 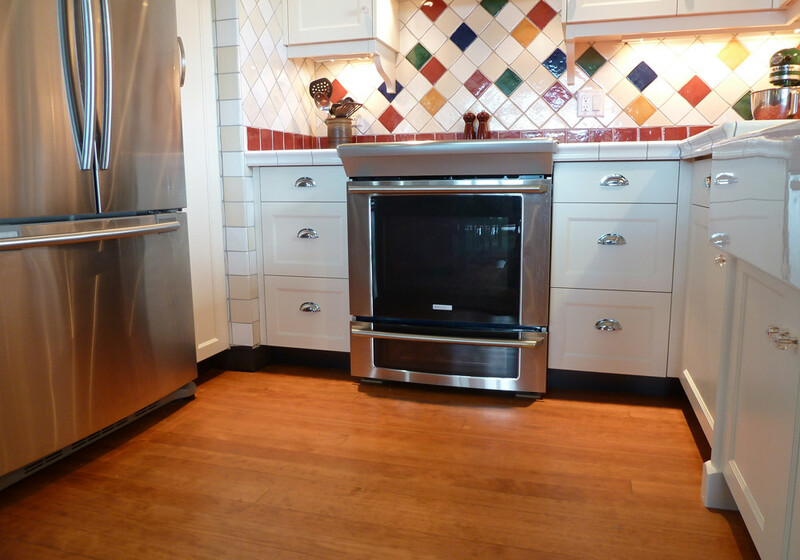 Faceframe cabinets demand a level of attention that does not allow hasty construction. 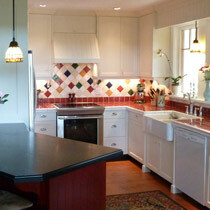 Careful planning was required to attain an aesthetic that is as seemless as can be. 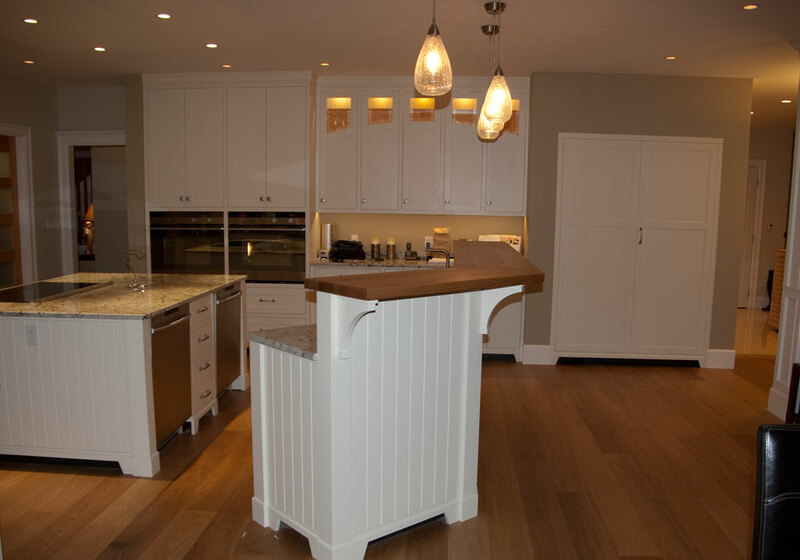 Clean and crisp lines, subtle details - like v-grooved panels and custom made corbels, as well as a well planned layout create a space that is both functional and pleasant. 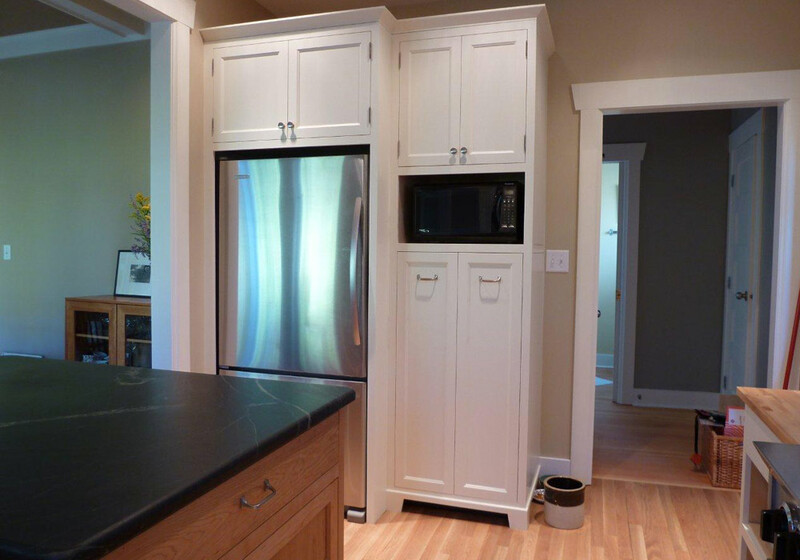 We have designed a fraceframe that does not block openings or protrude into cabinets; an attribute that matters when designing for spaces with limited room. 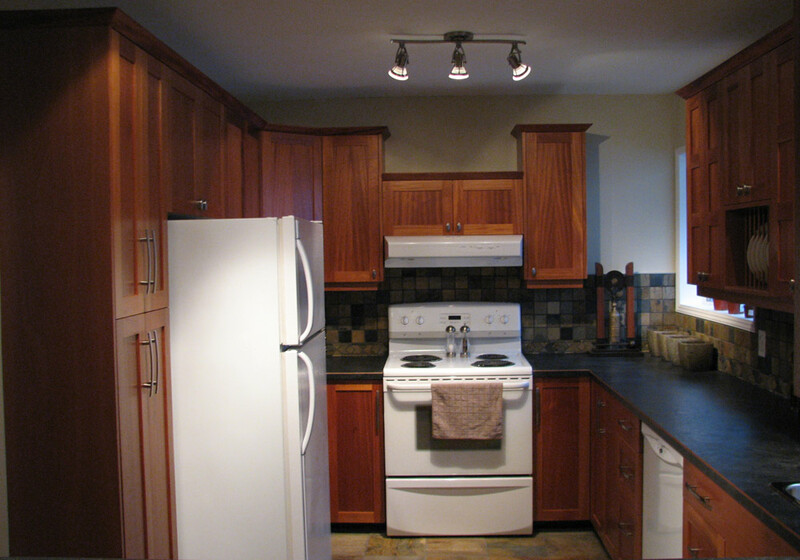 A small space demands a well planned kitchen. 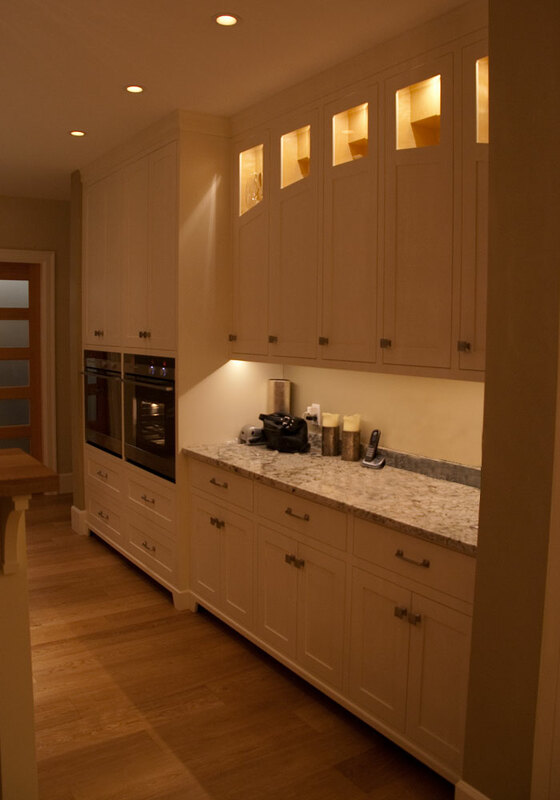 This kitchen includes a custom pullout pantry, coffee nook (behind pocket doors), and cabinets built into a hole in the wall. 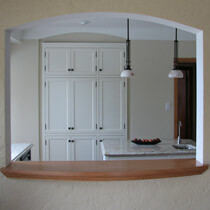 We custom milled the crown moulding to match the home's original trim. 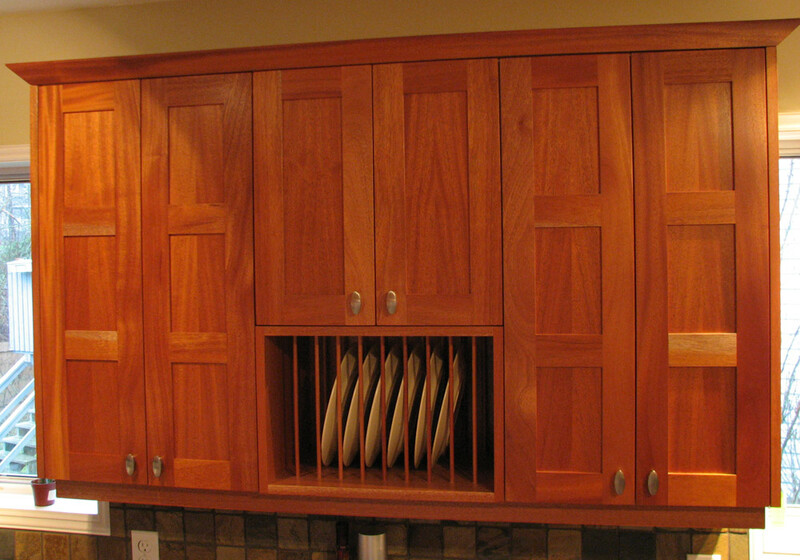 The advantages of a fully custom shop allow for unique cabinet depths. 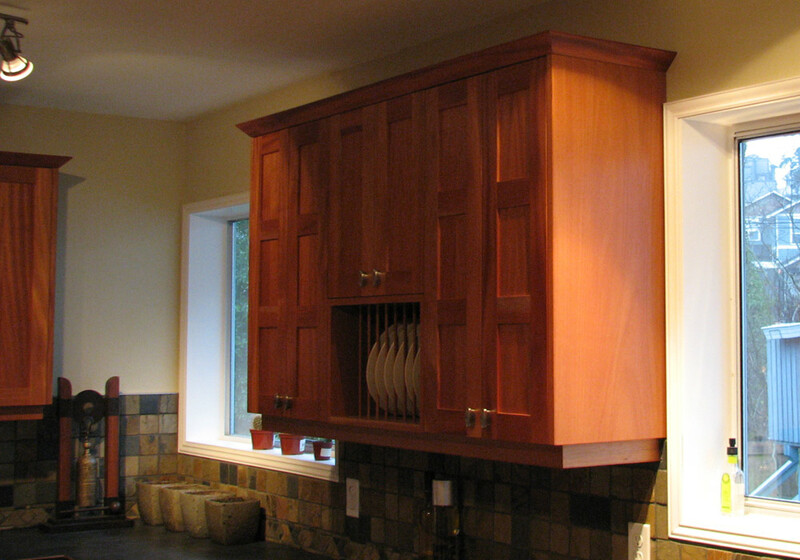 In this case, cabinets blend with the existing soffit to utilize the space efficiently and create a unique and aesthetically pleasing design. 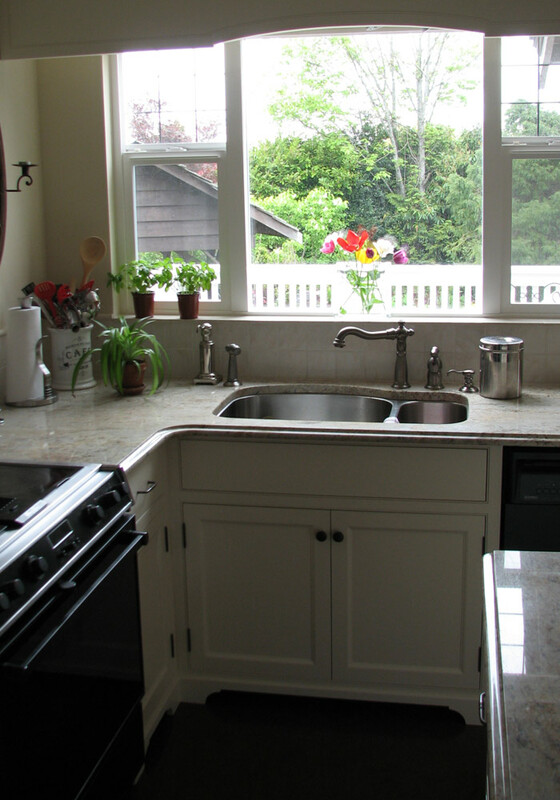 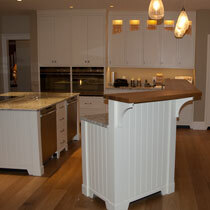 As with this kitchen, we will often custom mill trim and crown to suit a unique design. 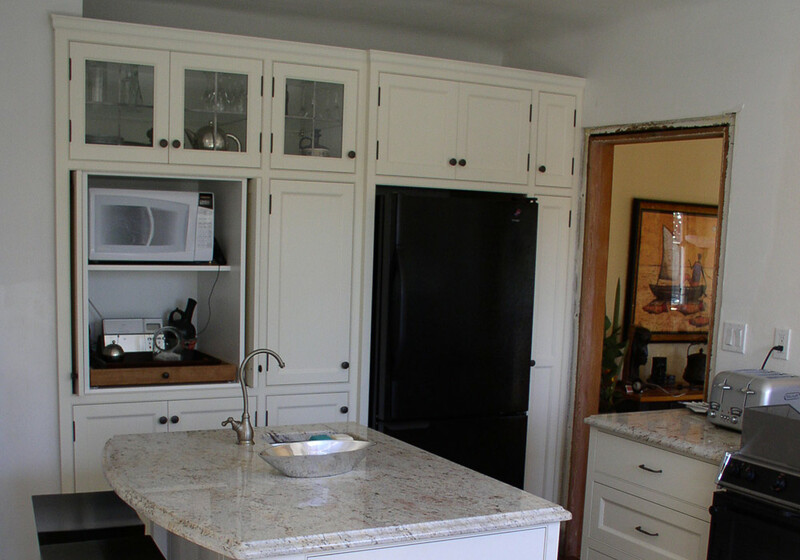 We work closely with homeowners during the design process through to the install to ensure that the end result meets or exceeds the initial dream. 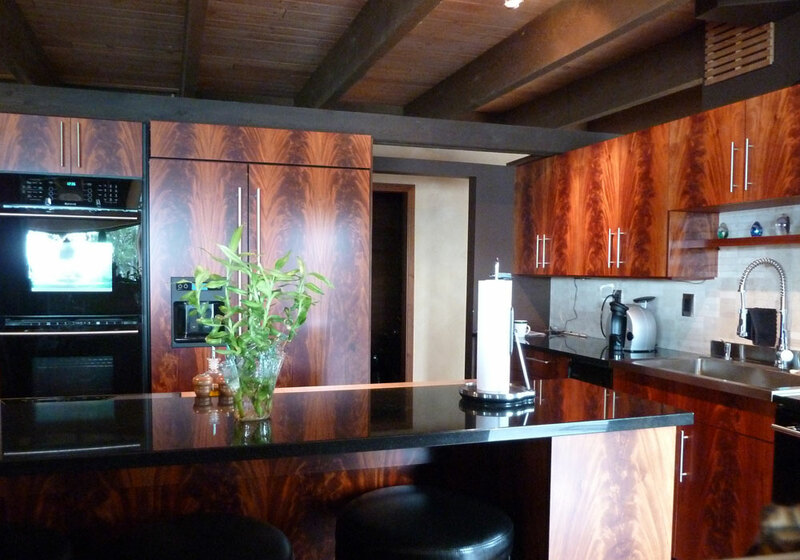 Crotch mahogany has amazing colour shifting properties, a feature that simply cannot be justified with photos. 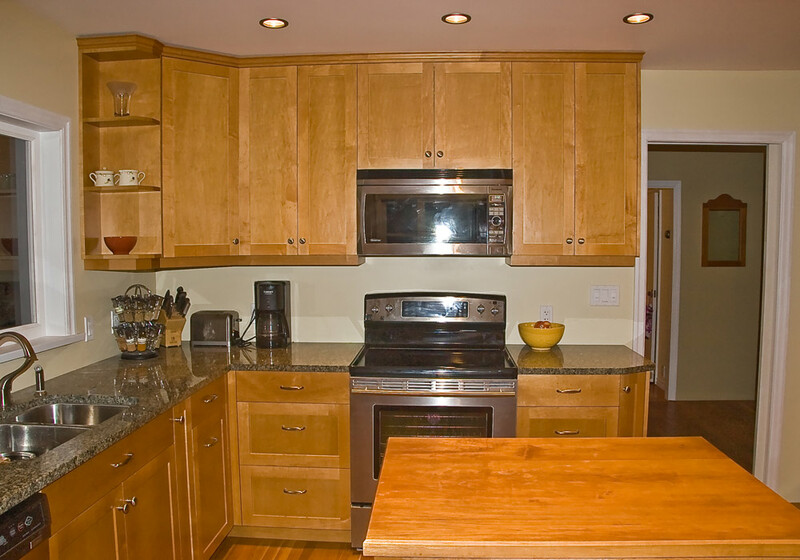 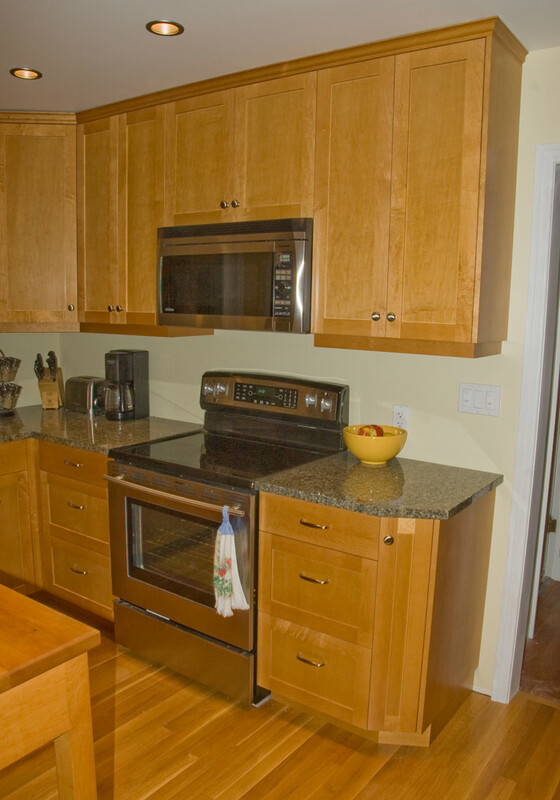 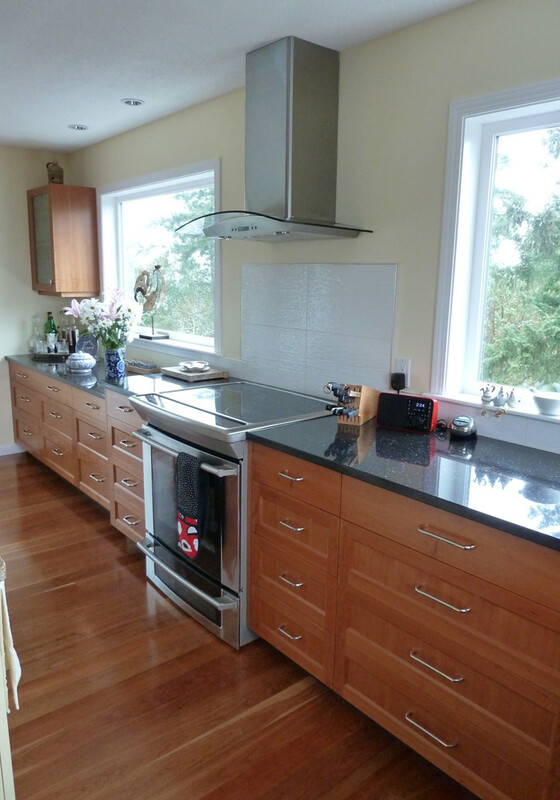 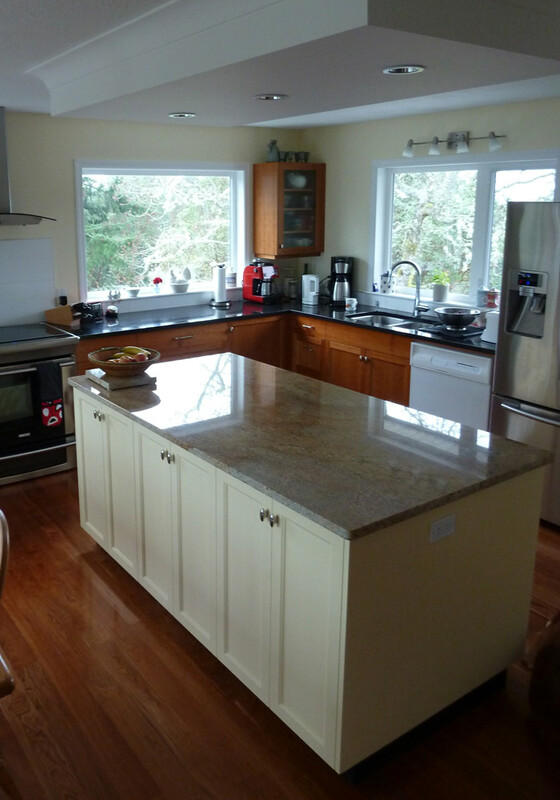 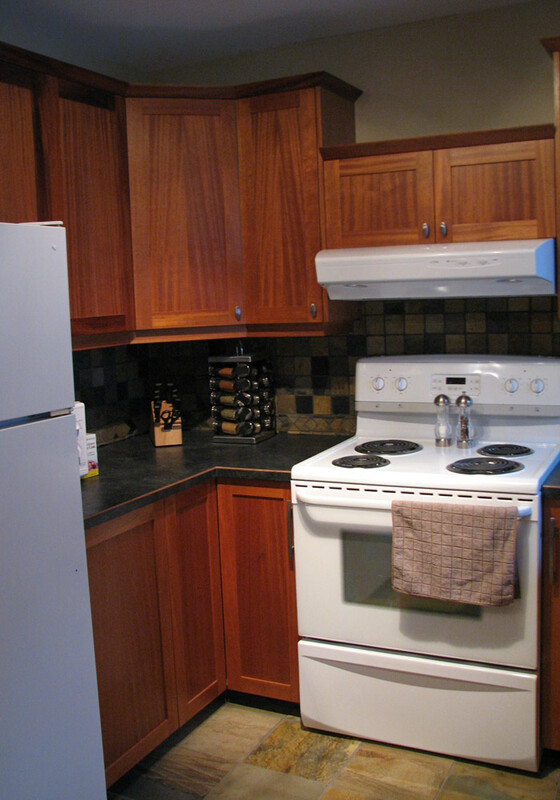 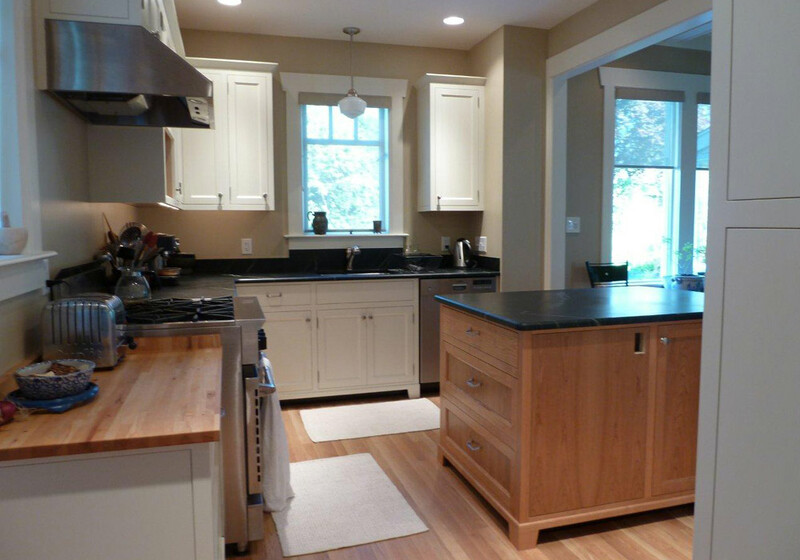 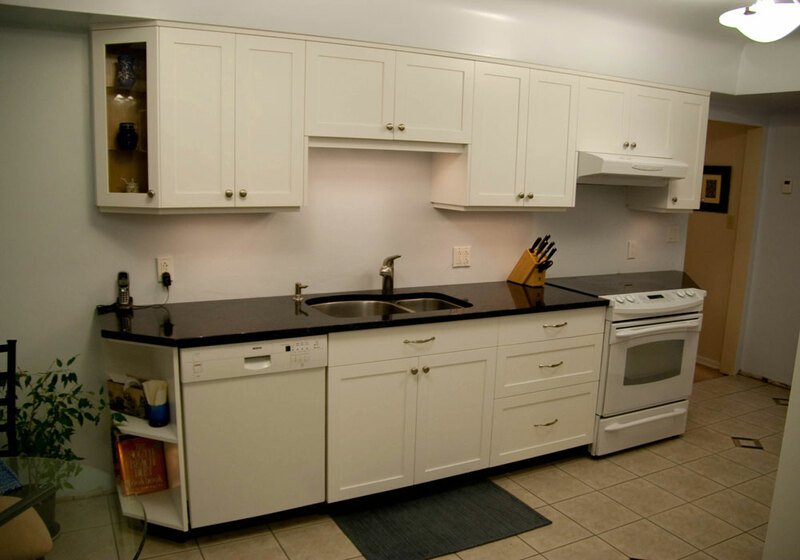 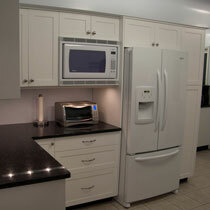 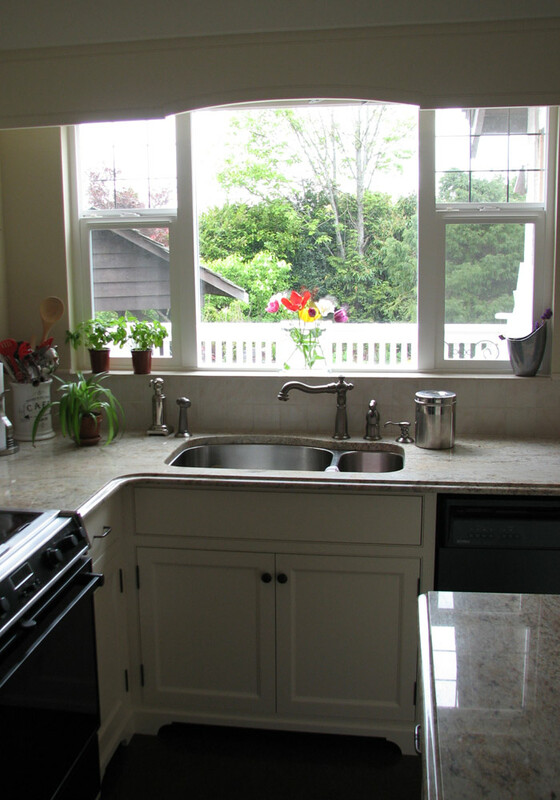 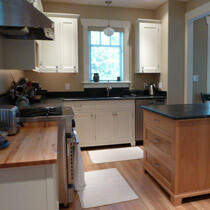 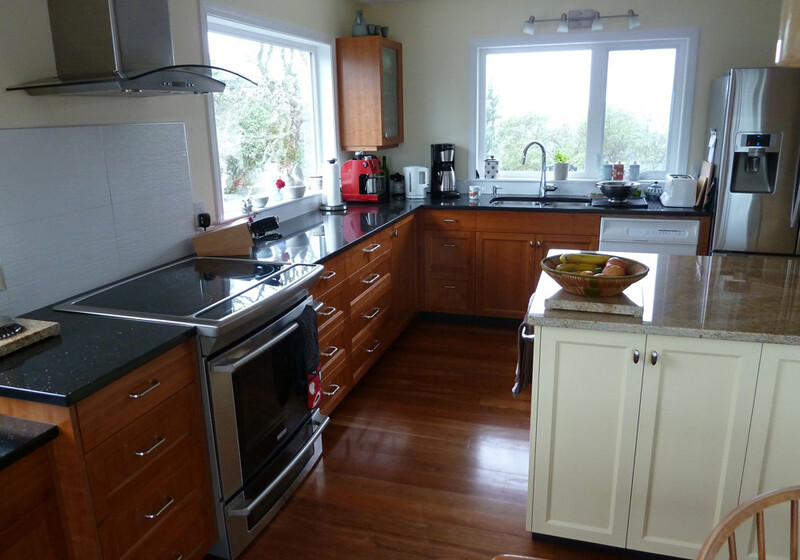 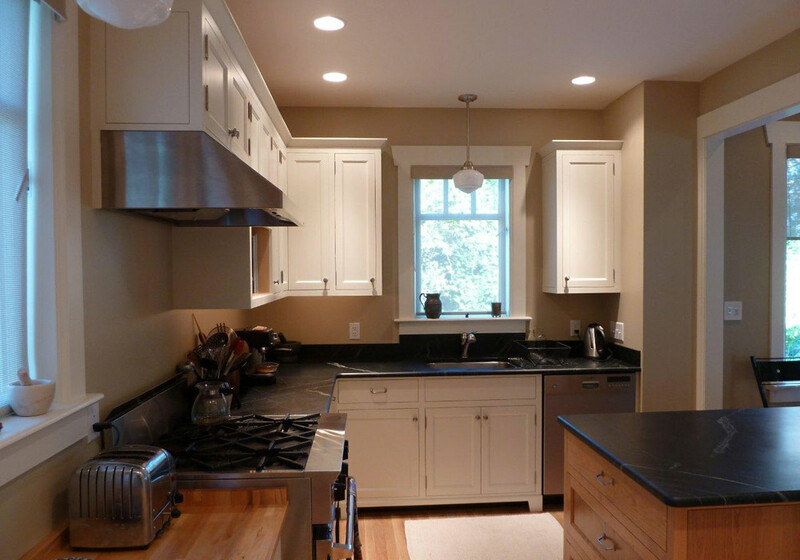 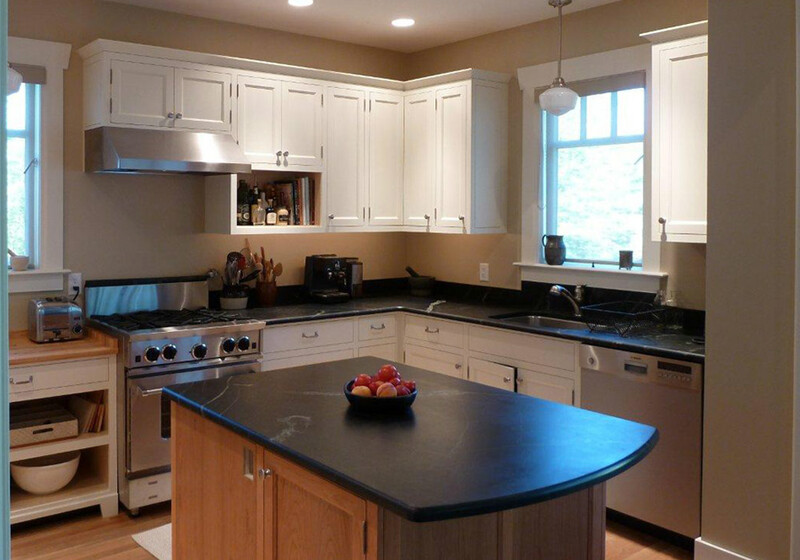 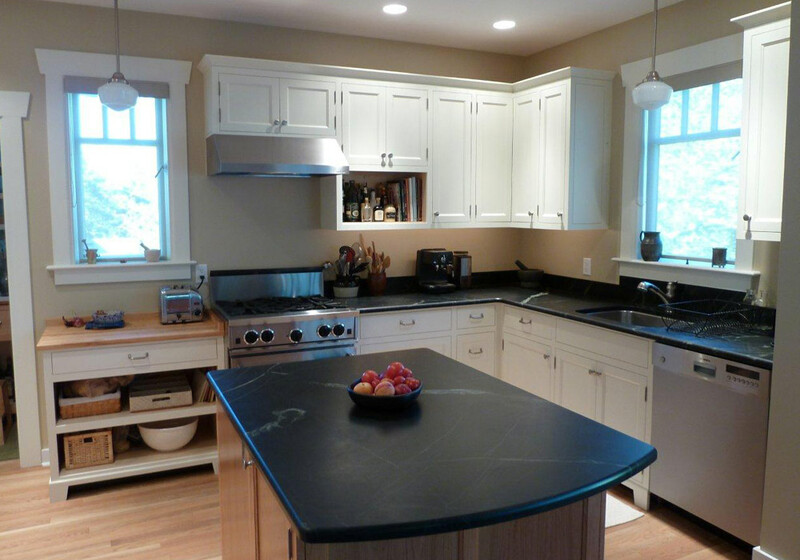 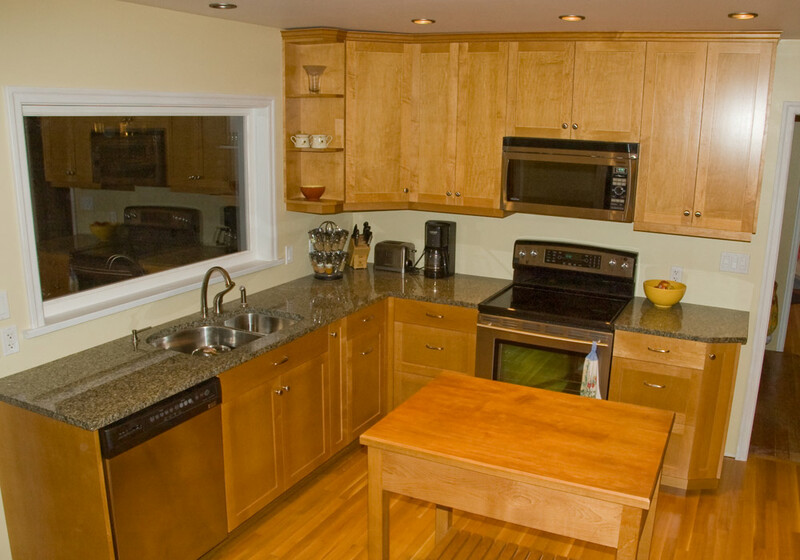 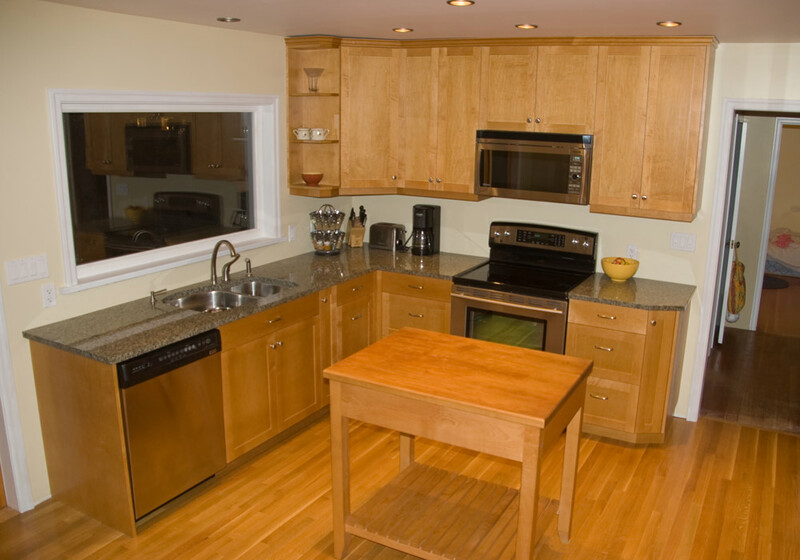 We built this kitchen, as well as two vanities, an office, laundry room and office from one log of veneer. 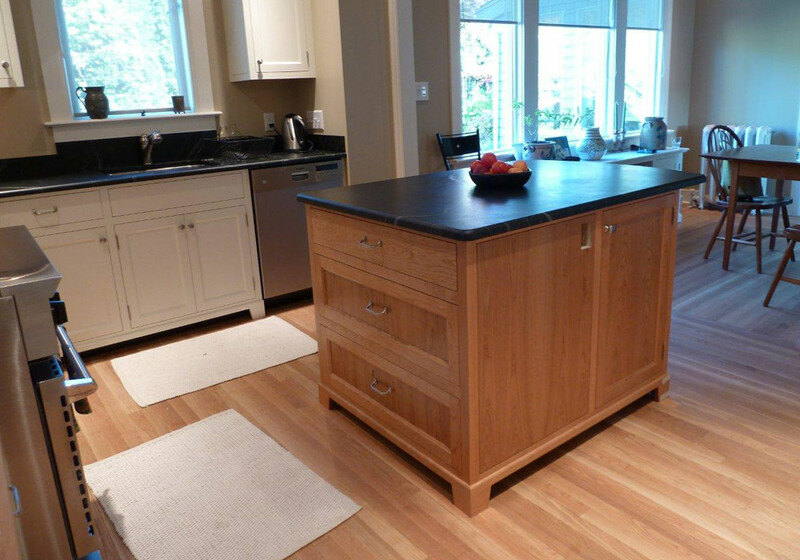 This kitchen features solid maple dovetailed drawers and custom veneered doors as well as a cutom made figured maple butcher block. 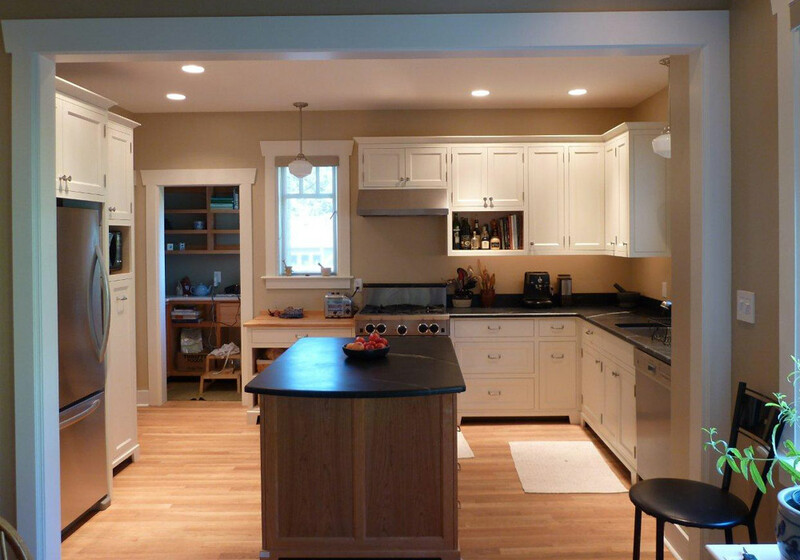 This kitchen features a custom pantry pullout, farmhouse sink flanked by pillar details, and custom made hood enclosure and valence above the sink. 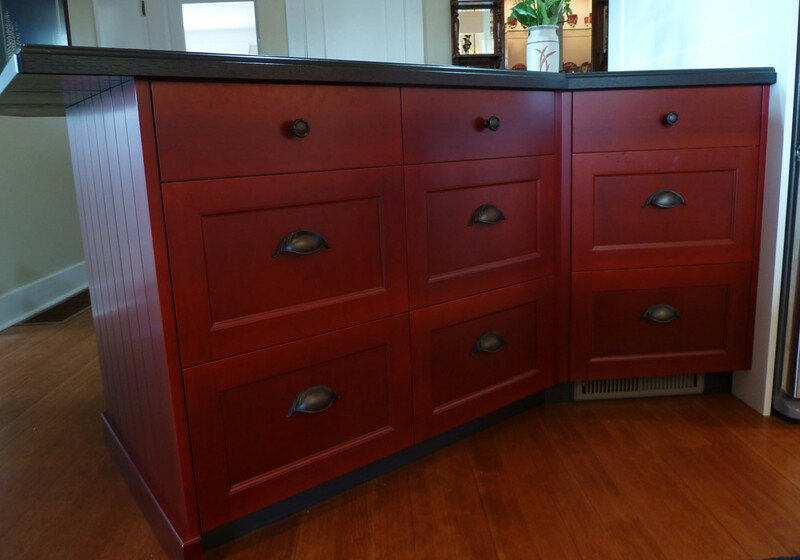 The cranberry peninsula is made from VG douglas fir and features v-grooved details and custom made corbells. 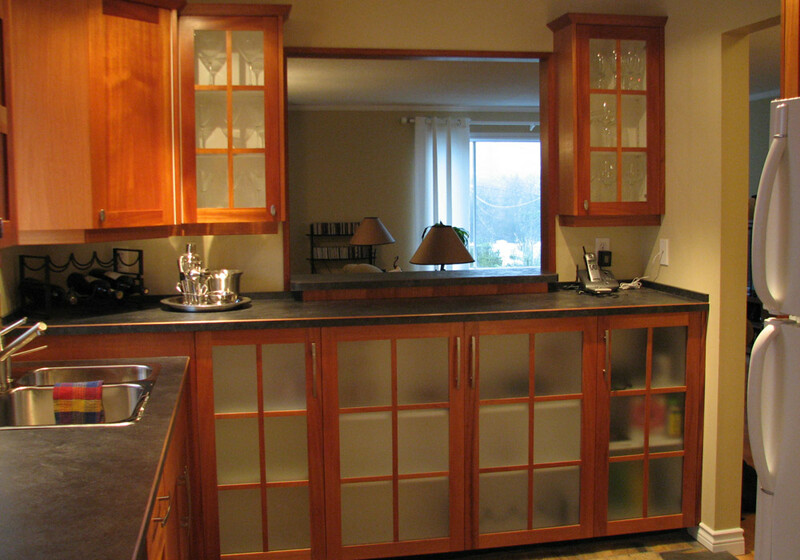 Behind the fridge, we built a piece to showcase the owners art glass collection. 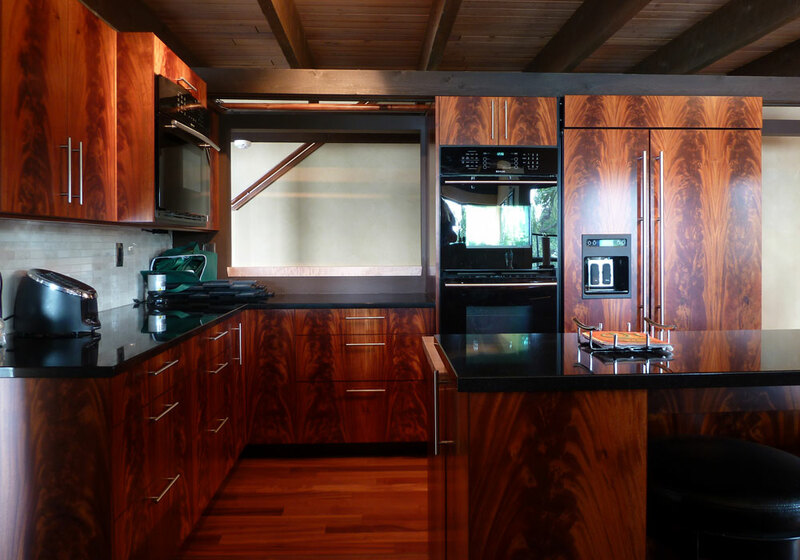 Wood species are diverse enough in colour that we can typically find an appropriate wood without applying stains or dyes that obscure woods natural beauty. 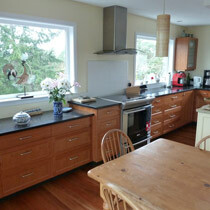 In this case, the client's desire for a hard durable wood required the application of colour onto eastern maple. 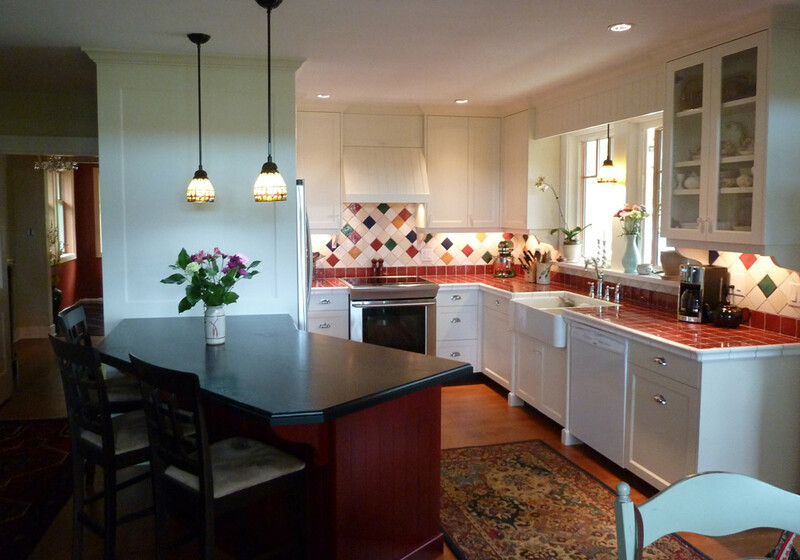 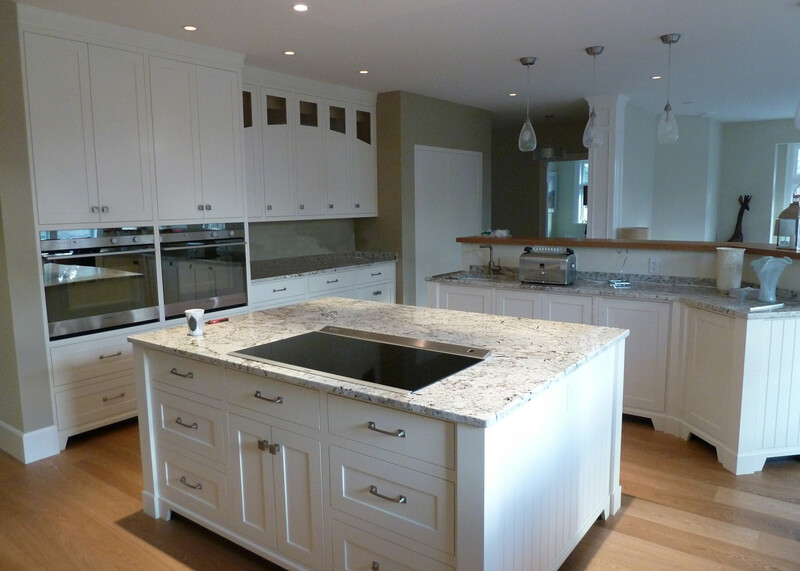 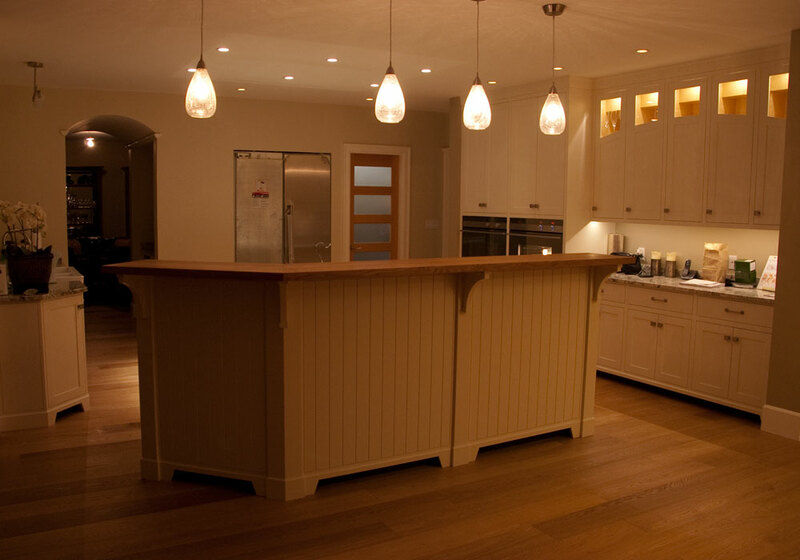 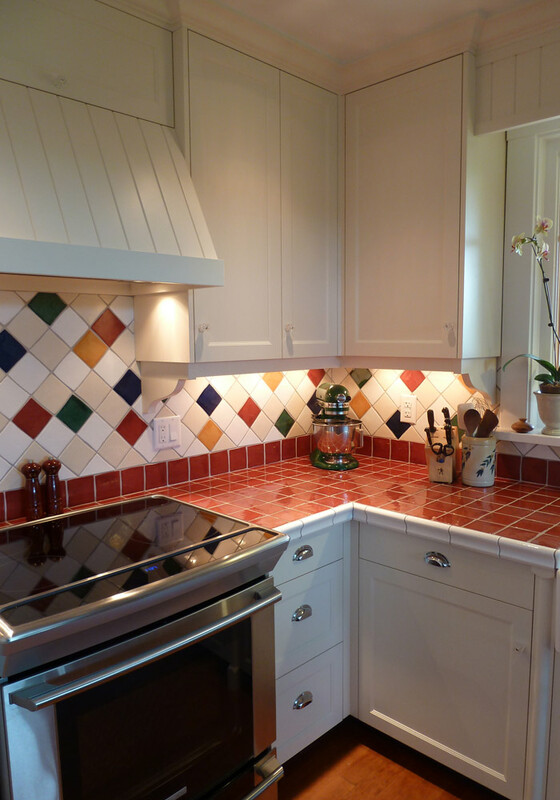 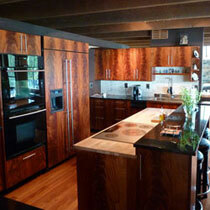 This kitchen was designed by the client, who was involved in every detail of the project. 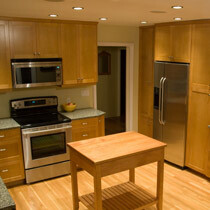 We work with our clients to strike a balance between cost and features. 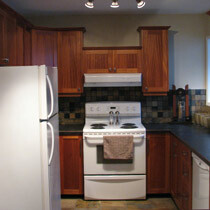 We discuss and present options that will help to stay within a budget. 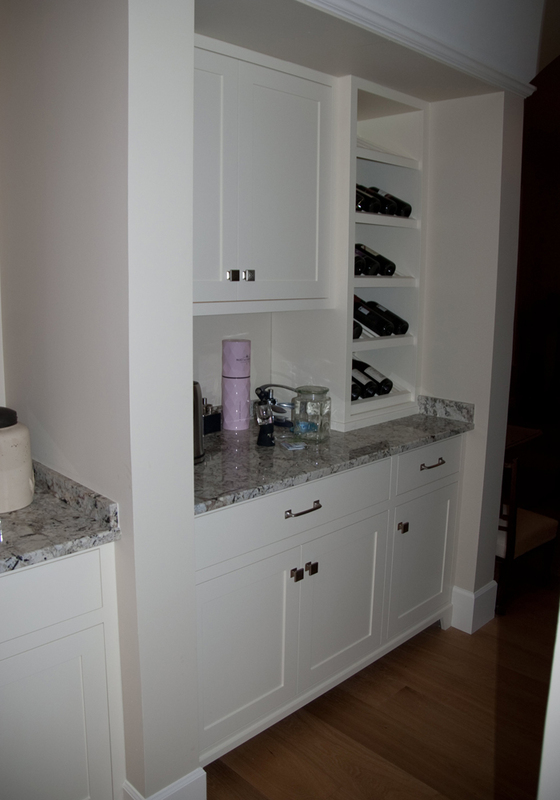 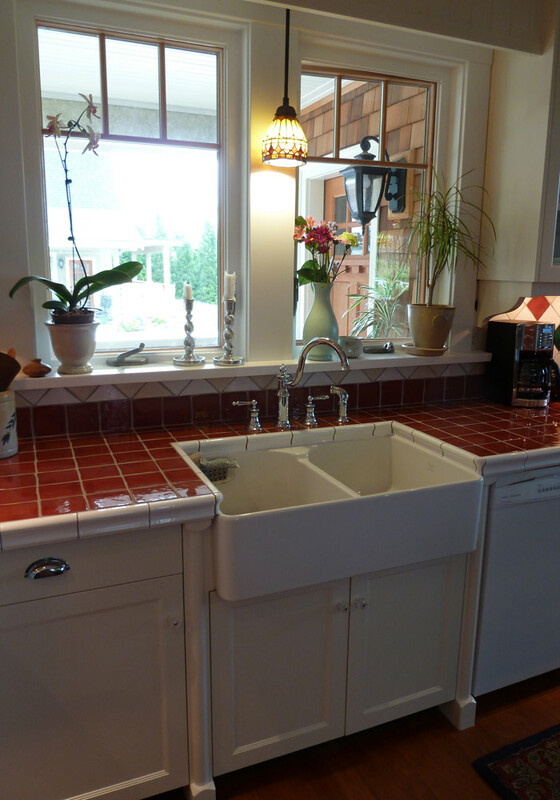 In this case, the client opted to limit the amount of drawers in the space, while keeping features like a plate rack and muntons on the glass doors. 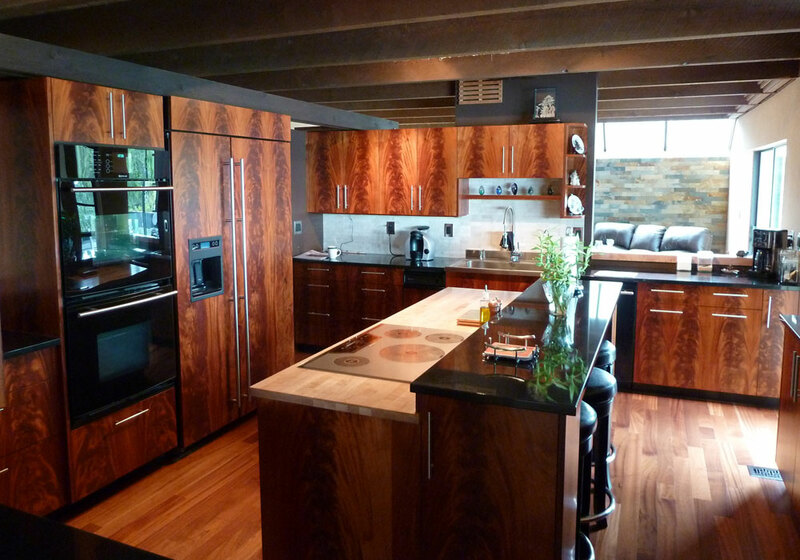 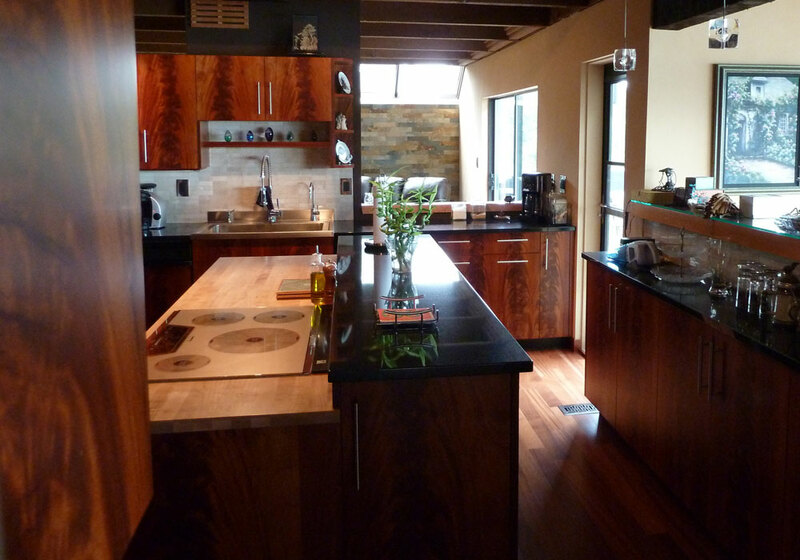 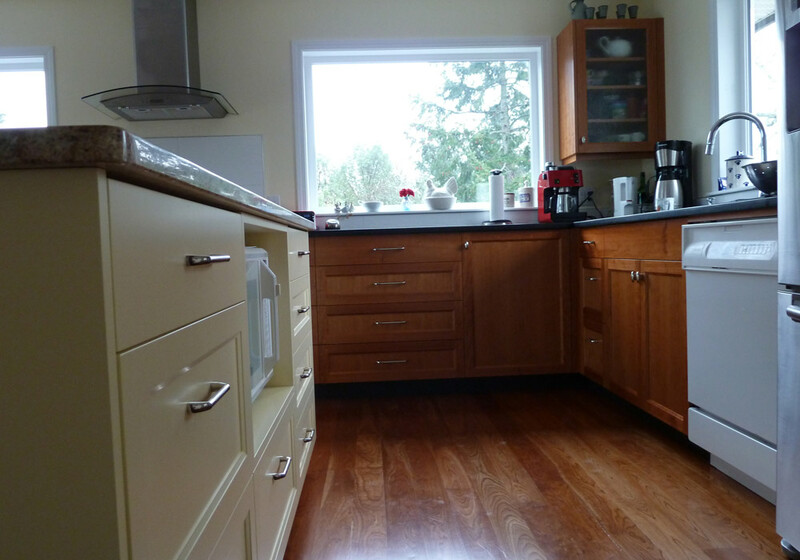 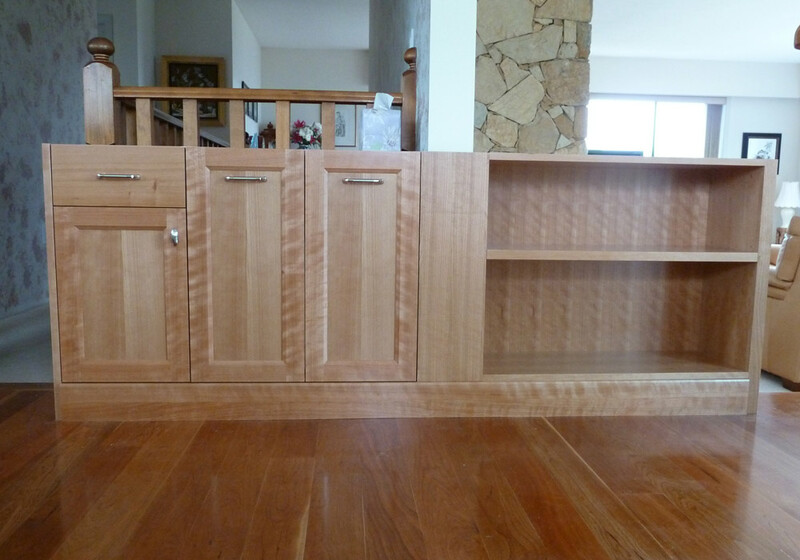 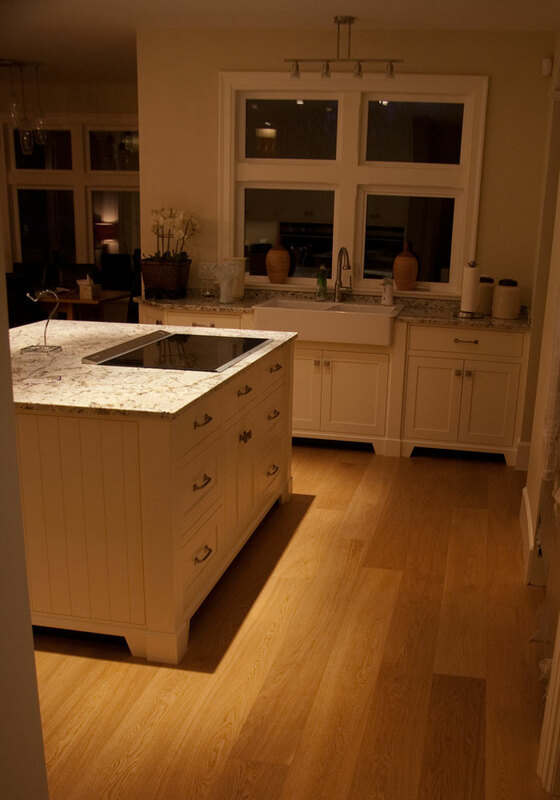 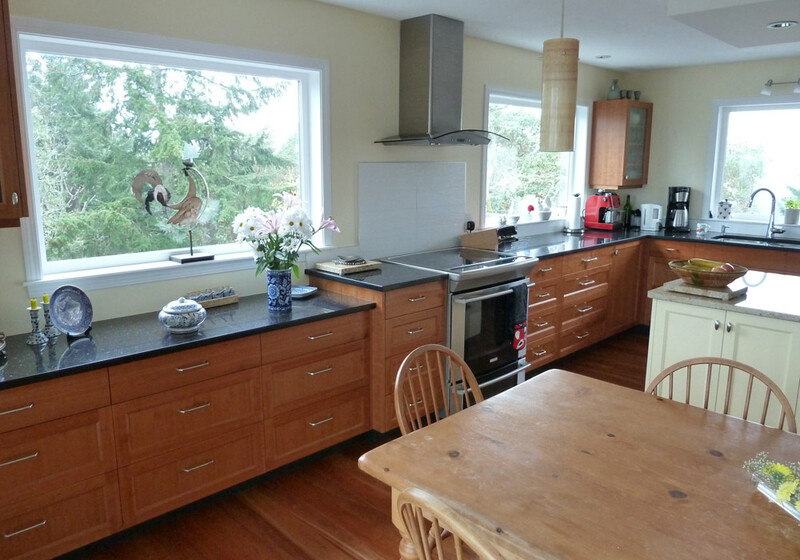 This kitchen features vertical grain cherry faces and many drawers. 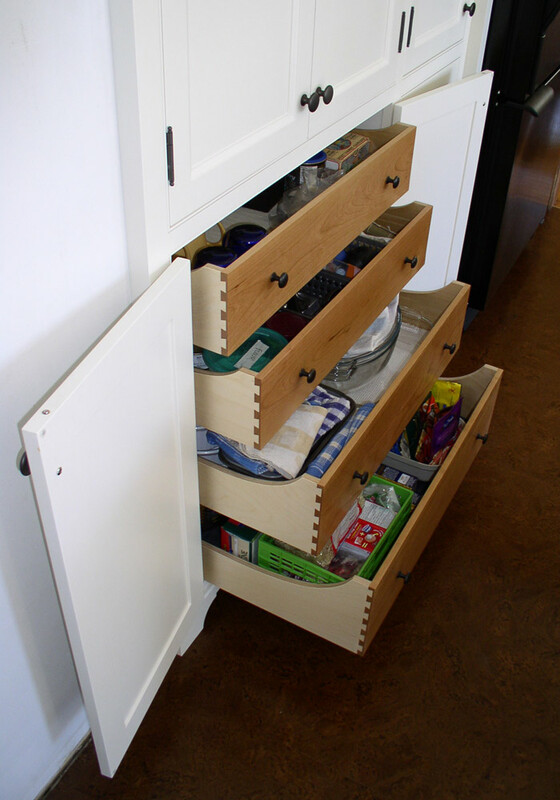 Drawers are, by far, the most efficient use of space for a base cabinet - a full extension slide provides access to all the contents of the drawer. 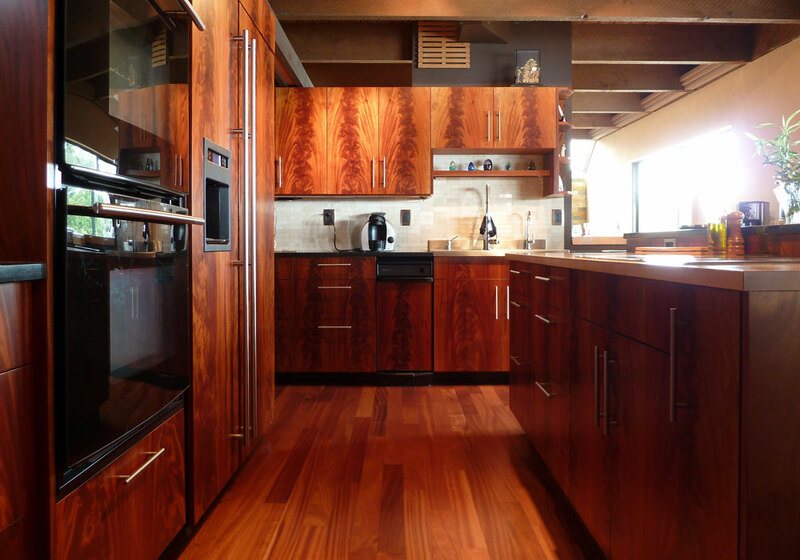 We were forced outside the box when we could not source vertical grain cherry: we used standard flat sawn cherry and custom cut the boards to attain the correct grain pattern. 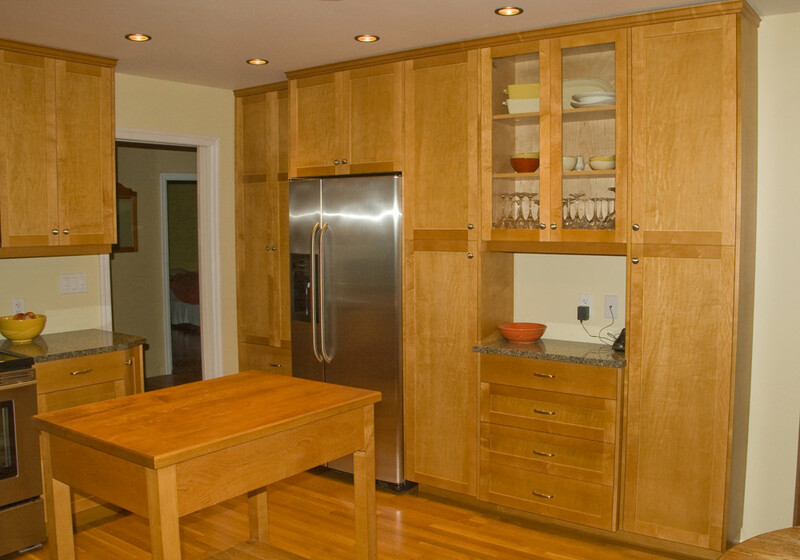 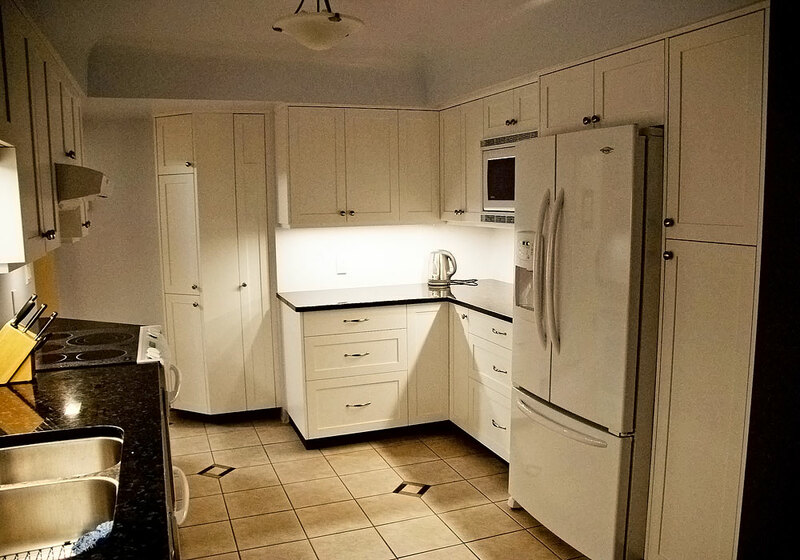 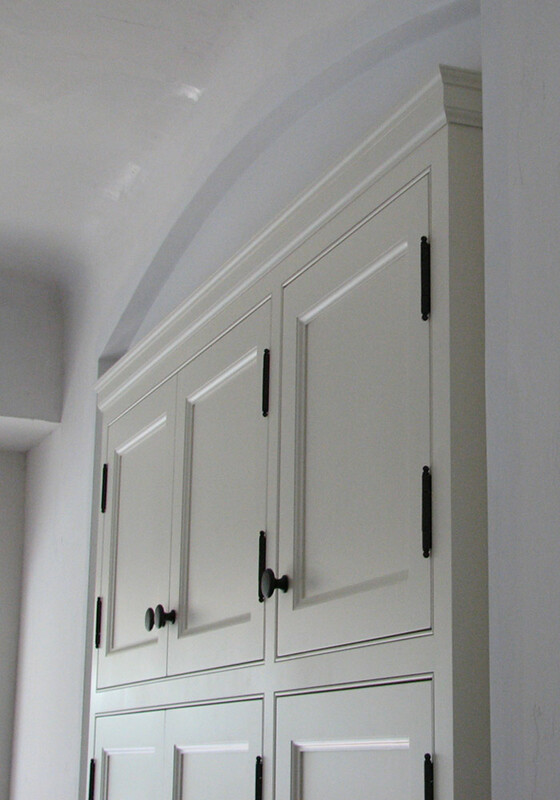 The faceframe elements on these cabinets were built from quality european plywood to eliminate the inevitable hairlines cracks that occur with traditional faceframe joinery. 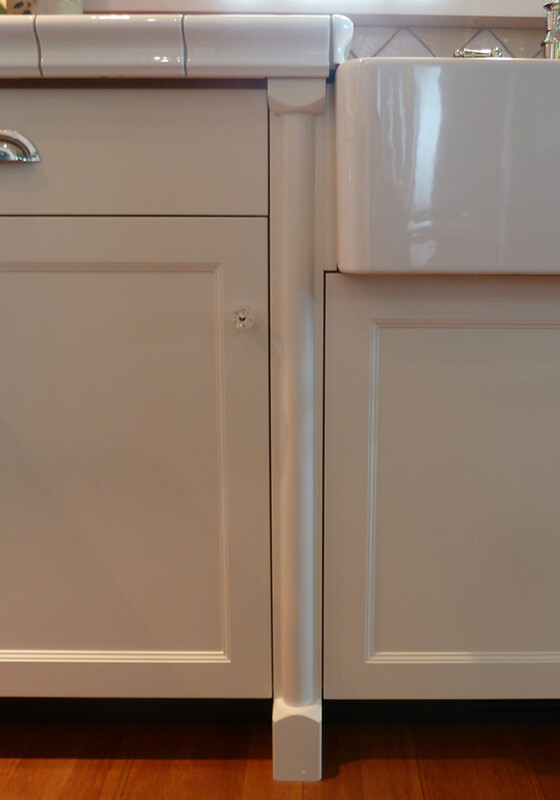 We only use this technique for cabinets with an opaque finish. 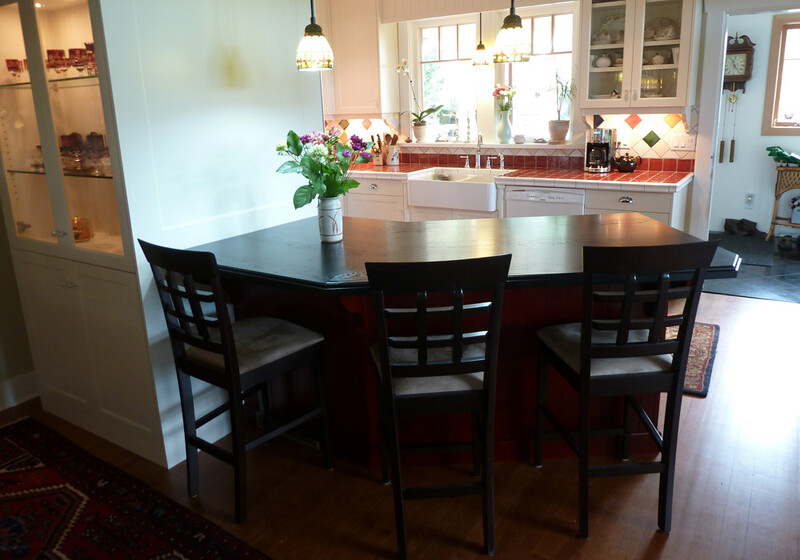 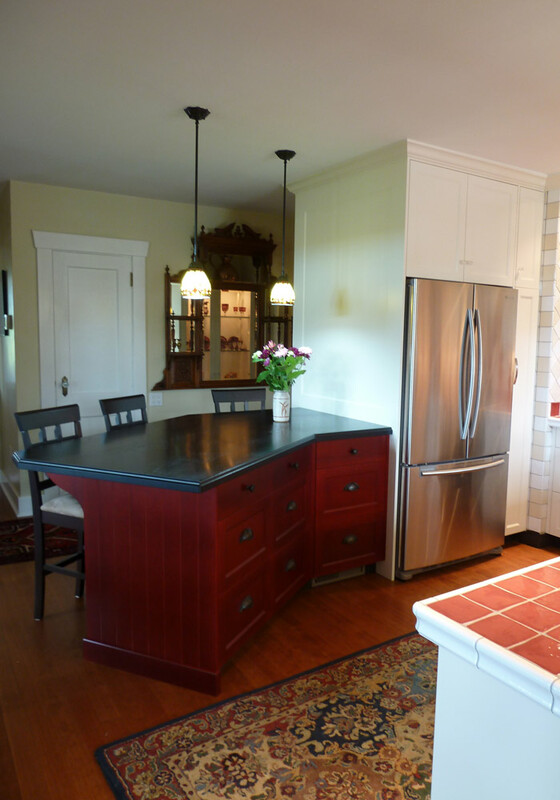 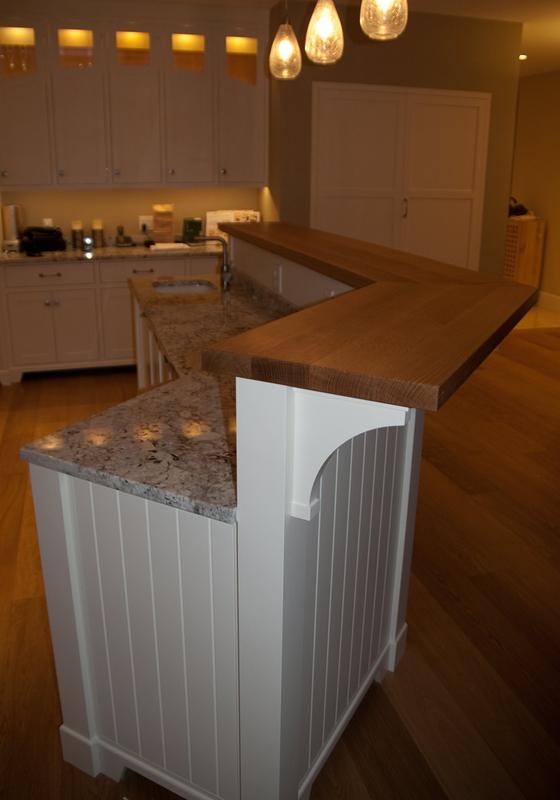 The cherry island features more traditional joinery on the faceframe. 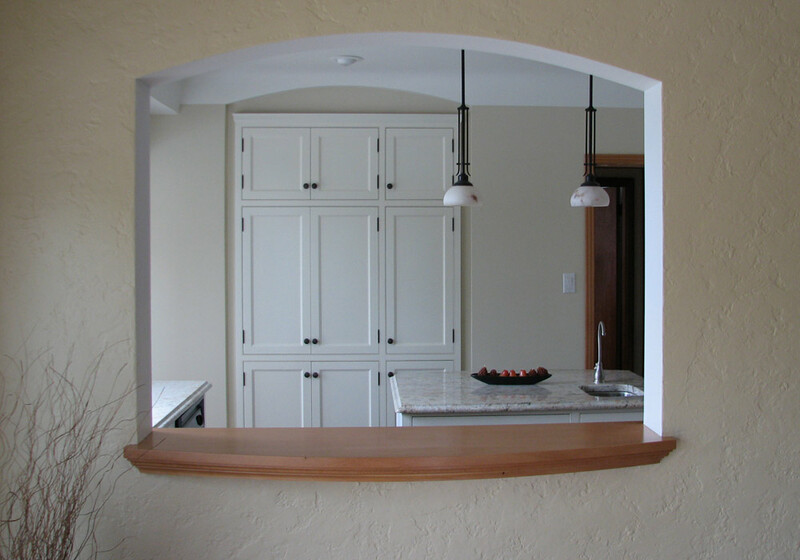 We custom milled the crown moulding to suit the more subdued shaker style.